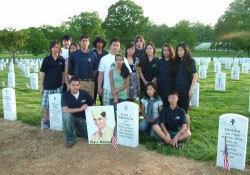 Robert Corpus and Stories of Service volunteers at Arlington National Cemetary at Peter Radonich's gravesite. Peter's picture is at middle lower front. April 1 begins the countdown to Memorial Day when Spirit of ’45 pays tribute to the more than 400,000 Americans who lost their lives in WWII who are represented on the wall of Gold Stars at the National World War II Memorial in Washington, D.C.
April 1st also marks the 66th anniversary of the beginning of the Battle of Okinawa, one of the bloodiest chapters in the history of World War II. It is also the anniversary of the passing of Peter Radonich. He died on Easter Sunday in 2008. Peter served as a combat infantryman during virtually all of the 82 days of this epic battle. His company suffered heavy casualties, losing more than 100 percent of its men in some of the worst fighting of the Pacific campaign. Peter was one of the lucky ones, suffering a leg wound for which he received the Purple Heart. Peter’s wife, Janice, had 6 brothers in service in WWII, four of whom were on Okinawa at the same time as her future husband. Janice died in 2009, and is buried beside Peter in Arlington National Cemetery. Youth with photos in parade. His story ends with a tribute to the men of Company C of the 184th Infantry Regiment, 7th Infantry Division, who made the ultimate sacrifice in service to their country. The video is now part of the Veterans History Project of the Library of Congress and has been shared with hundreds of schools, museums, libraries and veterans groups. Peter was one of the originators of the Spirit of ’45 initiative and helped Edith Shain start the first national day of remembrance that was held in the San Jose History Park in August 2007. Each year, Robert Corpus, the young high school student who Peter mentored for several years, makes a pilgrimage the nation’s capitol to visit Peter and Janice and to pay tribute to their memory. Peter talks about why it is important to preserve the stories.